Donna Druchunas drew my attention to the work of Felicity Ford, a creative British knitter who wanted to publish a book on stranded colourwork design. She needed funding, so ran a Kickstarter campaign, which I immediately joined. At the time, I was also working to publish “Annetarsia Knits”, so I felt a real kinship with Felicity. Yesterday, her book arrived, and I am so happy for her, and for the knitting community who can now enjoy her work. 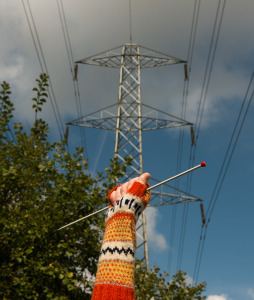 “Knitsonik” is a different sort of book. 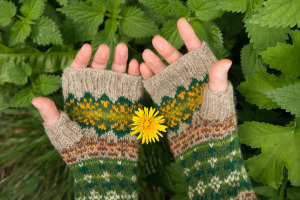 It isn’t a pattern book (there are only 2 patterns in it, for very basic fingerless mitts and legwarmers). Knitting isn’t really the point of the book, at all, it is simply the medium used for Ford’s artistic expression. She is inspired to create patterns from objects she sees around her – nature, places, designs. The book is a resource to teach you how to be creative, and turn what you see – successfully – into a charted knitting pattern. Knitting is easy. Being creative, for many of us, is what is hard. How do you teach creativity? Ford breaks it down into practical steps – exercises and instructions on how to do them. Practice the steps, and gradually patterns emerge that guide you onward. Photographs of large swatches with rows and rows of changing patterns, with commentary on what she observed at every step. You can compare your feelings about color and chart changes, with hers. We all see and feel things differently, but seeing how she evaluates the knitted swatch gives you a head start. This is a very unusual book, and it will prove to be a valuable addition to a knitter’s library. For those who take it seriously, who study it and practice with the exercises, I suspect this could be a life-changing book. If you aren’t really interested in spurring your own creative juices, Fords’ colourwork charts are very modern, and will appeal to most knitters. 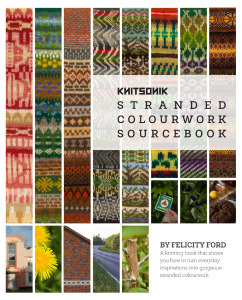 It is exciting to see a young British knitter update the classic stranded colourwork designs. Kudos to her for also teaching us specific exercises to spur our own designs! I have a feeling that this book will resonate with the knitting community for a long time. Felicity Ford is one to watch!